Publisher: Sampson Low, Marston & Co., Ltd. and Dennis Dobson, Ltd. Description: Book 14 in the series introduces a new character called Bumpy Dog, who loves everyone so boisterously he knocks them over! In this story, he helps Noddy catch the goblin thief. Delightful full-colour illustrations throughout; several of which are full-page. Illustrated endpapers and pastedowns depict a panorama of Toytown with various characters strolling along the beach (including Big Ears and Golly). Laminated pictorial boards repeat the jacket design. Jacket is scuffed along the top and has a crease on the rear. It is also torn where it meets the head of the spine, but is still complete. Not price-clipped (3s. 6d. net). Were it not for the previous owner's name in the ownership panel, the book would be effectively as new. All pages are crisp, clean, free of foxing, and tightly bound. Undated first edition. 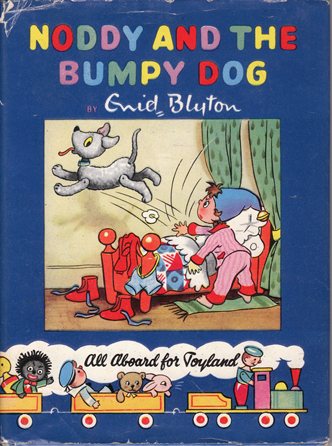 Noddy and the Bumpy Dog is the last title listed on the rear flap. Measures 19 cm × 14 cm (7.6″ × 5.6″). Large 12mo. 60 pp.